Students select beads from paper cups to make bracelets representing their initials based on binary numbers. From the left are Minh Shaikat of Hudson, Erik Clifford of Ichabod Crane, Khloe Thomas of Hoosick Falls and Kaitlyn Scalera of Hudson. Tech Valley High School’s computer science students led Hour of Code activities for the entire school on Friday, Dec. 9 during Computer Science Education Week. Hour of Code is a one-hour introduction to computer science (CS). The CS students organized multiple activities that featured various skill levels, from beginner to advanced user, in line with the Hour of Code mission to demystify “code” to show that anybody can learn the basics. “Personally I have deep passion for computer science, so it was a great opportunity to share that with my peers and hopefully inspire them to also have an interest,” CS student Kyle Sharpe of Cairo-Durham said. Each activity was instructed by two CS students. 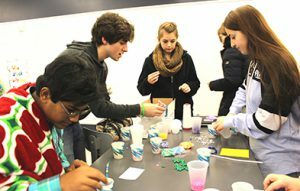 Activities included bead bracelet making, where students could make their own bracelets representing their initials based on binary numbers, and a Flappy Bird activity, where students could customize drag-and-drop programming to make their own game. Students could also learn how to code Raspberry Pi computers to take selfies, photos and videos, and use drag and drop coding via Scratch to animate their name and add sound and music. Advanced activities included game coding and learning HTML. By the end of the activity, students were exposed to making basic websites in HTML, along with inserting headings, paragraphs, multimedia elements, and changing text and background colors. Sophomore Puresvuren Batdorj of Rensselaer has a strong interest in computer science, and the Hour of Code activities helped her explore something new. “I had never really tried HTML before, so this was a good opportunity to,” she said. The Hour of Code is organized by Code.org, a public non-profit dedicated to expanding access to computer science and increasing participation by women and underrepresented students of color. The Hour of Code is a global movement reaching over 100 million students in over 180 countries. The website says computing is the No. 1 source of wages in the U.S. There are more than 500,000 computing jobs open nationwide. That includes more than 2,000 in the Tech Valley region, according to Albany Can Code. Computer science graduates enjoy the second-highest starting salary and the highest full-time employment rate within six months of graduation.